Best pricing will dictate shipping with either UPS or USPS at the time of order processing. International rates are available via USPS only. International customers are responsible to pay any taxes and duties that might be assessed at the border. Please check with your local customs or postal authority regarding such charges. The buyer can also expect occasional time delays at customs. Next Day and 2nd Day shipments can also be accommodated. Additional shipping charges based on package size and destination will apply. Please note in the comments field at checkout if you desire Next Day or 2nd Day shipping. Or contact us when you place your order. 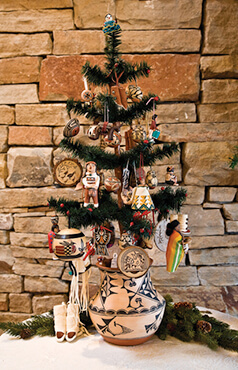 Certain items will require additional shipping charges due to weight or fragility, for instance, some pottery nativities. Returns may be requested, for items in their original condition, within 30 days of purchase date. The personal information you submit to our store will not be shared, sold or disclosed to third parties in any form, for any purpose, at any time. We will not disclose your sales history to third parties for any purposes, at any time. Here at Susan’s Christmas Shop we have a firm commitment to privacy. We do not collect any financial information (like visitor’s bank account or credit card numbers). All the payments are made through PayPal. You can use any major credit card (or your own bank account) without exposing your account numbers. Your payment is made over a secure encrypted connection so credit card numbers and private details can not be stolen in transit: using PayPal is as secure as online ordering can be. With your permission, we may send you Susan’s newsletters, containing news about our store, new arrivals and cultural happenings in Santa Fe and surroundings. 3. email us to be unsubscribed from our mailing-list (make sure you are sending it from the e-mail address you want to be deleted).